Erasable programmable read-anly memory integratit circuits. Thir packages hae a transparent windae that shaws the die inside. The windae allaes the memory tae be erased bi exposin the chip tae ultraviolet licht. 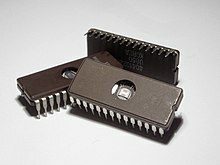 An integratit circuit or monolithic integrated circuit (an aa referred tae as an IC, a chip, or a microchip) is a set o electronic circuits on ane smaw plate ("chip") o semiconductor material, normally silicon.